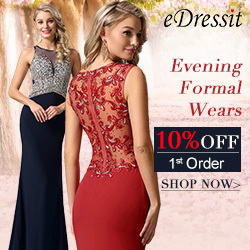 On the memory of the summer and formal event, there is always a dress glittering a variety of fashion, all kinds of formal party, special occasions, entertainment, all kinds of simple ride, compliments and praise, please pay more attention, eDressit will show you all kinds of first-hand fashion sparkling beaded, sequin formal dresses and amazing evening prom dresses! 1. From 20th June. 04:00 to 30th June. 24:00(Berlin Time), we selected all sparkling dresses for you, you can enjoy 30%-50%OFF discounts. 3. Coupons and points can not be used for this deal.（Except for newsletter exclusive coupon).